As many times as I have stuck myself with a pin or a needle over the past few weeks I am surprised that I didn't pop given the amount of excitement that has had me blown up like a balloon. Introducing Anna Maria Needleworks! (awh, phew, I can feel the air escaping out my fingertips as I type). I've alluded to it, shared some of the behind the scenes on projects, and geesh you've been looking at evidence in my blog banner for a while now too. But its almost here (as in a couple of weeks). Now let me tell you what it is. There is a lot in the Needleworks collection that will follow these beautiful threads, but what I thought I would do today is share some close up shots of some of my first projects with these goodies. I am also excited to direct you to my friends Kim and Kris over at the diydish.com where they've posted a video today of our sitdown time at Quilt Market. Its as good an explanation as any of how I've been using these threads, and what more we have to look forward to as I introduce all the projects and fabrics that I've been working on for you. They are also hosting a giveaway, and a free embroidery pattern from yours truly, so head over there to watch the video, then meet me back here. (waiting. waiting. waiting.) Oh good, you're back! I'm sorry about all my hand motions, and that I need a haricut. I wouldn't blame you at all if you hadn't come back after that Crystal Gale lookalike you had to listen to. Anyway. This quickly became a favorite pre-market project for me. 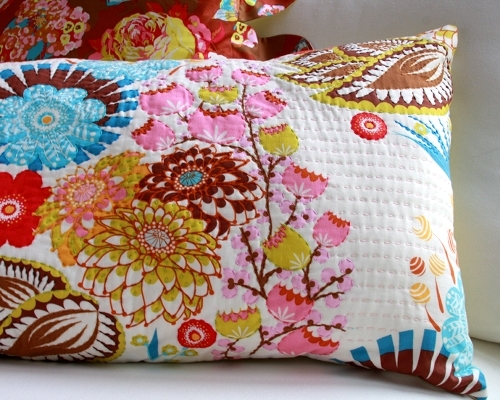 It is simply a hand quilted pillow. I layered the pillow front, just like I would a quilt top, batting and backing sandwich, then pinned, basted, handquilted, trimmed and finally sewed into a pillow. This is the dress that Juliana is wearing in the video. Its another version of the Painted Portrait Blouse & Dress (available in July). 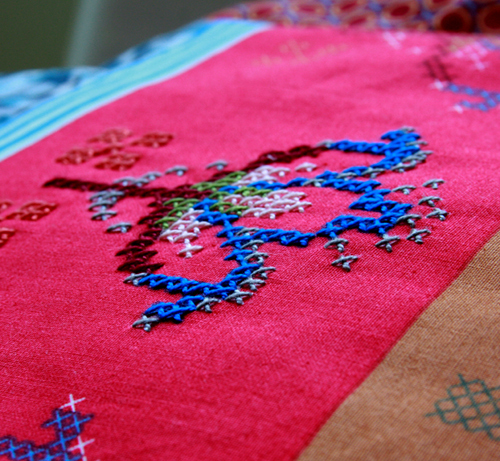 The yoke features one of the 6 Loulouthi Needleworks prints which will be available later in the summer. These goods are no different than our printed cottons, except that the design work is all little cross stitch designs, and they are 60" wide instead of 44/45! Yay! You can leave them as they are, or stitch over a little or a lot of the cross stitch pattern. I'll be sharing better views of those 6 pieces later this week. I used the pearl cotton for the above, but you could also use any number of strands from the stranded embroidery floss as well. Here is part of the yoke a little closer up. The stitching was really pretty quick and I love how simple, but also sort of elaborate it is, and how the stitches interact with the print to create sort of a veil over it. Maybe like you're looking at a garden through a window screen or a fence. Also on that little lady was a cross stitched, sewn belt with a stitched flower on the side. That was seriously fun. This is a better view of the embroidery that I was sharing on the video as well. I embroidered each flower with a series of different stitches all on a cream colored linen. I then cut those out and hand stitched them to the grey cotton with a running stitch (actually I'm pretty sure my mom did the running stitches on two of those for me, and Juliana did the 3rd, but you get the idea). This piece will remain an artwork but there are so many different ways to use the same design work in other ways. Which I think might be what I love most about this hand work. Up to you. Speaking of you, the free Loulou Bouquet Embroidery downloadable pattern is available for your pleasure over at the diydish, so get down and load it. We'll have it on the make page soon too. Phew. And that's not all, but this is me sliding in my bookmark, and resting my wrists for a bit. (And did anyone catch that fun little announcement towards the end?) More soon. Yummy yummy yummy!! I can't wait to get my hands on these!!! this post made my crappy day so much brighter!! i love that you have this line! you have inspired me to stich and i am so excited to get those pearle cottons in my hands! happy happy me! What a wonderful evolution of your work! Well done AM, a sure fire winner of a new line of products. I wonder if they will make their way to Canada? Oh my, did that Crystal Gale comment take me back! 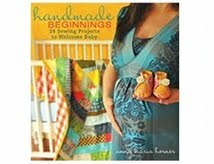 Loving everything -- especially the quilted fabric pillow (can't wait to make one of those!) and the sleeveless blouse -- Gorgeous!!! I love that there are aquas in the perle cottons! Do you know when and where these will be available? Wow, those are beautiful! I've done a little embroidery in the last year and it is so relaxing and fun. Loving it all! I know its been said many times before, but you. are. amazing. !!!!!! I love everything and am totally inspired! Wow you are going to be even busier now since you are throwing Janome into the mix. And did you say you might not have a booth anymore? Glad I got to meet you at this market and hopefully we will run into each other again sometime. How exciting! I have been so inspired by your embroidery work lately - the simplicity of the stitches combined with your beautiful prints - so lovely! AM you are the woman. I've been so inspired ever since your embroidered pillow post. When money is tight, what a great way to keep on crafting! Thank you for this lovely surprise! I can't wait to get my hands on these skeins! And to end things, a pat on your back and a loud shout for you being so cool. Be Still my heart! I've been looking for bright Anchora 8 since I found them everywhere in Portugal. Now I know where I can load up on more here on this side of the world. Embroidery is my first love before garment sewing and quilting and so I tend to work embroidery techniques and my ebroidery fibers into any garment or quilting project I do. 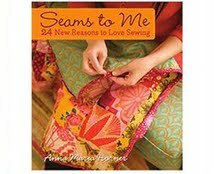 I have not seen any other designer feature needlework as a component of garments and quilting projects in such an inspiring way! I can't wait to get my hands on your threads! I love the idea of embroidery on clothing. Can't wait to get my hands on some of that gorgeous Cool floss! Oh my goodness, I love everything about this! I especially love the dress/handwork that you describe as being viewed through a screen - I cannot wait to make something like that! I am also crazy about the cross-stitch fabric - so clever! In Love!!! These will be perfect for lace edging a baby blanket, I just hope they can find their way to Puerto Rico!!! What a beautiful range I can't wait to get my hands on this fabric...Anna you have such a way with colour and pattern -sigh. I am downloading those beautiful embroidery patterns now. Anna Maria... you are lovely! I cannot wait to get my hands on these cotton threads. I love to embroider, and these heavier strands look so bold and beautiful. I am also excited about your new role as a Janome spokesperson. My sewing machines were second hand, until my husband gave me a Janome for Christmas. It's been about four years since that wonderful day, and I love my reliable machine. Unfortunately the shop where it came from closed... and I missed my "free" classes, so I still feel like I am not taking full advantage of all the options, and no doubt we are due for a tune-up. I am not suggesting you are going to be my personal sales-rep, but I do feel like I will have an experienced and sincere advocate who might have Janome tips and ideas for us! And please... your graceful and expressive hands, your lovely hair... you have nothing-nothing-nothing to apologize for. I admire and appreciate women who are genuine, with beauty, like yours, that is timeless, and skills that are inspiring. Love your newest...I'll be looking for them in your shop! Wow, these are all jsut amazing!! Absolutely stunning! I can't wait to get some of these embroidery products and of course, I am all in with partnering with Janome (I have one too and love it). Love it all- Congratulations on the sponsorship! I am not great at embroidery, but it still makes me excited to try when I look at what you have done. I usually think of embroidery as counted cross stitch, which is a little boring for me, but the idea of stitching around the patterns on the fabric, etc...is really very alluring! Thanks for adding more ideas & projects to my list! Personal note here: this combo fabric line/floss would have brought me closer to my Baba if she were alive. She was a gloriously talented cross-stitcher. Her embroidery was the envy of even the other Baba's in town. I had started quilting when she was still alive, but I wish she were still here to see how I've grown. To see the quilting and fabric love combined with the embroidery love is pure love for me and it will always make me think of my Baba. Sadly, the only chance I've had to combine her work with fabric was on the pillow we made for my Dad's coffin last month. Sad circumstances, but still a thrill to combine our work. Thank-you for the comforting memories and joy at the thought of new creations. I also love to do embroidery like this. 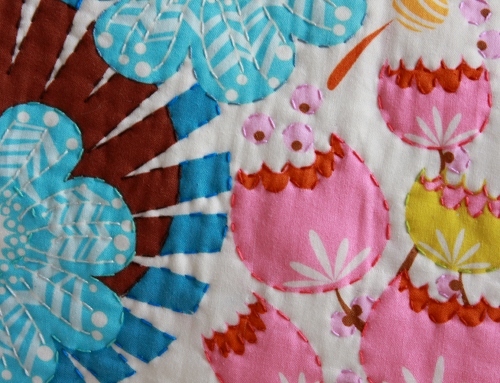 It is so fun to just embelish beautiful fabric. Am looking forward to getting your threads in my collection. Now off to find that download. Oh this is so fun! I've only recently tried my hand at embroidery and I'm hooked. I can't wait to try this design. Thank you for the free pattern! Oh, I'm terribly excited about those thread kits! Everything you made up looks so beautiful! at this risk of asking a dumb question, what do you suggest with your perle cottons? I am a machine quilter and sewer and not very handy with hand sewing, however, I follow everything you do religiously! So as an AMH groopie, can I ask for a tutorial on hand sewing/embroidery? I love your picture of hand embroidery on a pattern, but again, I"m not a hand sewer so I need more! FYI, I made 2 scarves last winter with your kits and patterns, which received rave reviews. I enjoy telling people that a fellow UTK alum is a creative genius I like to follow! So exciting! Congrats Anna Maria! Can't wait to get my hands on the Portrait Blouse & Dress pattern! Oh this is lovely and the projects are soooo inspiring. Also I must say I was super nervous to watch you on video, I have been a "fan" so long I was afraid I would not like you "live" But you seem so nice and real and very happy about your work I am super relieved. I told my husband today "I wanna be Anna Maria Horner when I grow up" And he answer "and have six kids? oh, gods" (we are expecting our first) BUt at least that means he knows who you are, so he s paying attention, who new. this is indeed very exciting news! thrilled for you, and all of us!!! LOVE! I can't wait to buy some and get better at needlepoint. These pretty little things are exactly what I have needed to be motivated to improve upon hand sewing, needlepoint, and embroidery. And I love cross stitch! I cannot wait to get my hands on these! Thank you!!! I love the the flower you added to the sleeveless version of the Painted Portrait Blouse. It's so cute =D I also love the new thread and fabric... just gorgeous!! Oh, wow, I am so excited! I've been quilting with perle cotton for a long time, now. I'm excited to try something else. Your blog cracks me up, but still inspires me. Thanks for making my day! Anna Maria, I just wanted you to know that my 14 year old daughter just ooooed and awwwed over your embroidered pillows! "I want that!" I told her that would be a great project to start since school is out in 2 days! We will be on the hunt for your beautiful fabric! Thanks! Congratulations on becoming a spokesperson for Janome! The new threads are beautiful and all the samples you shared are gorgeous can't wait to get my hands on some Needle Works! AAAAH! Pretty, love it!!! It brightened my blah day, too....so thanks for that. 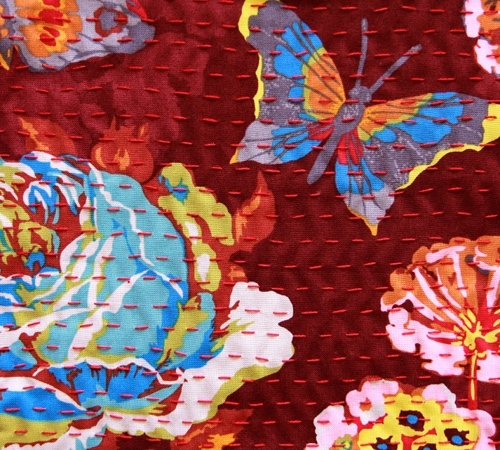 I love the rust fabric with butterflies, I can't wait to get some of that. absolutely beautiful! I cannot wait to try it!! I am going to love making that new blouse pattern!! All of these announcements have me salivating and I can't wait to get stitching! Your work is so inspiring! Are you kidding? You looked amazing! I am so excited about this new line!! I'm so excited cuz one of my fav fabric stores here is a Janome dealer and they also carry your fabric -- maybe they'll carry even more!!! Can't wait for those beautiful embroidery cottons and cross-stitch yardage!!! My eyes are on overload! Pure visual delight! Your style shoots straight to the soul. 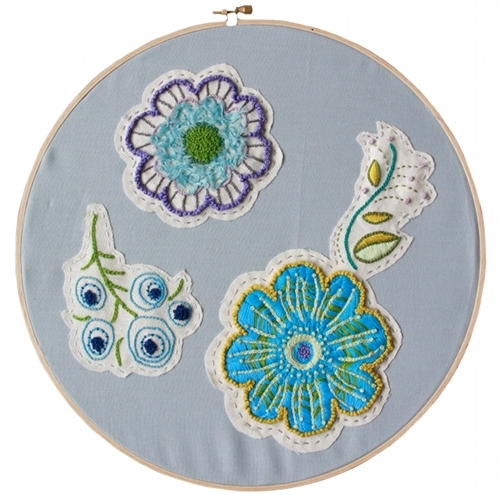 Add to that my love of embroidering and I am over-the-moon with your new designs and products. 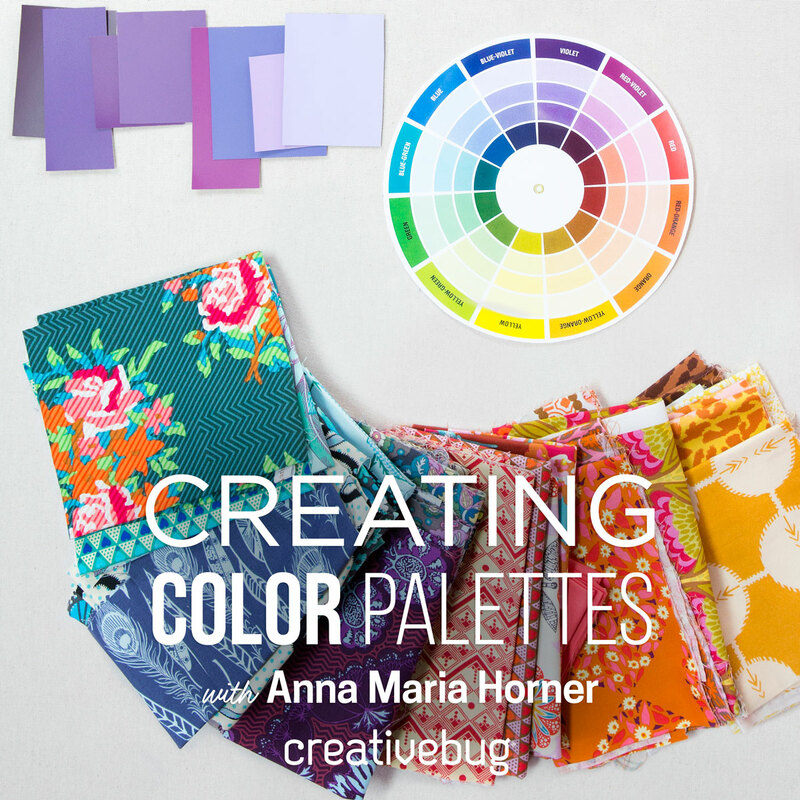 I bought an assortment of perle cottons a couple months ago, but my color assortment/coordination wasn't great and I was wishing I could have my own little Anna Maria sitting on my shoulder helping me with my color combos. 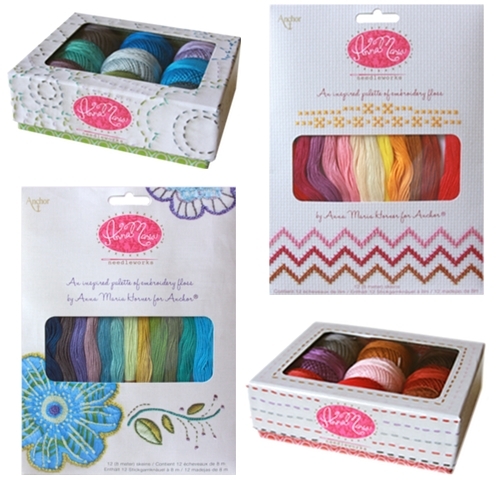 So glad you are offering preselected color combos of thread! thats so exciting! Everything you put together is amazing. July cannot come soon enough ! 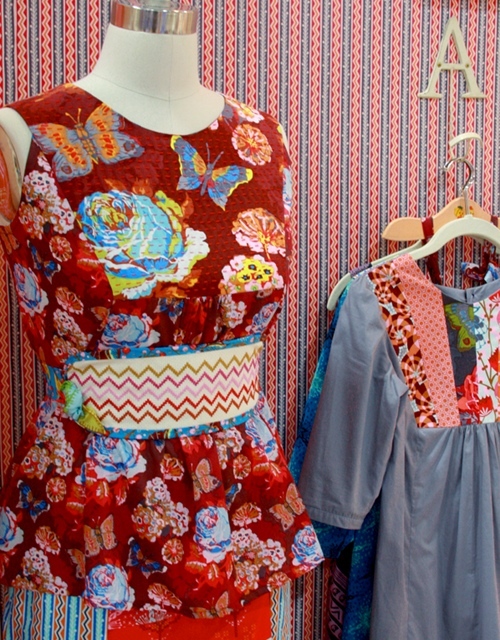 Cannot wait to get my hands on the Painted Portrait Blouse & Dress pattern!!! As always, beautiful designs, beautiful fabrics - keep u the fantastic work!!! Beautiful Fabrics and a beautiful family!! I try and buy a piece (or two) from each of your collections. your excitement is so darn contagious!!! !.....you are so very talented!! Thank you, thank you for sharing the flower pattern!!! You made my day. Loved the interview. You look beautiful with your long flowing hair! I can't wait to get my hands on the Loulouthi collection and your new perle cottons & embroidery floss. Congratulations on the Janome partnership. You are amazing. Your creativity is so inspiring! Thanks for sharing it and your lovely family with us on your blog. That pillow is truly lovely. YAY, Anna!! 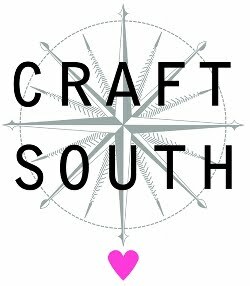 I'm sooo excited for all of your needlework goodies! I can't wait to get my hands on these! That pillow is truly lovely. your new line again is so amazing can't wait to get my hands on it !! & your hair is beautiful..& hand motions, I use my hands when I talk- it's a way to express ourselves- there (good excuse:)..it was so nice to see Juliana was at Market with you! Wonderful video with Kim & Kris at the Market. Your booth is so bright and colorful. Can't wait to get my hands on those beautiful thread collections. Great interview and I love the new fabric line. You have inspired me to try hand quilting and embroidery! Right before I read this post and then watched the video, I had just ordered the fat qtr set of the whole line. Now I'm anxiously drumming my fingers on my sewing table waiting to get the perle cotton! 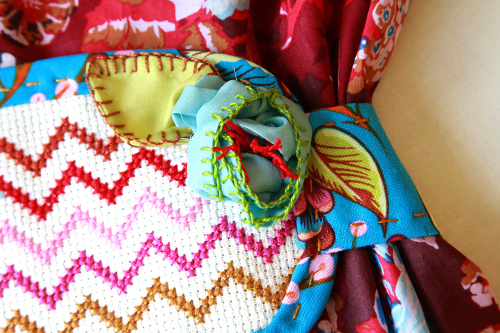 I love the colors of the thread and the hand quilted pillow. Beautiful! Totally cool. Not usually a "needle-r" but I may just have to explore! I really like the quilting style with the Pearl Cotton. Since I am a hand quilter I usually use a needle size 11 and hand quilting thread. I would like to know what kind of needle are you using for quilting with Pearl Cotton. Anna Maria finally I have good reason to request this small favour...seeing that you have designed and named your new line of fabrics after your girls it seems only fair that your next line of fabric be named and inspired after your boys! Just in case - my son loves red, and I know there are many women out there who would love male inspired fabric that doesn't include pictures of cars and dinosaurs! Love all the vibrant colors and exciting flowers. Thanks for the close ups of your stitches. Could look at them forever. sorry but I don't have a blog; I just sew, sew, sew, and stitch and quilt. these photos are terrific! 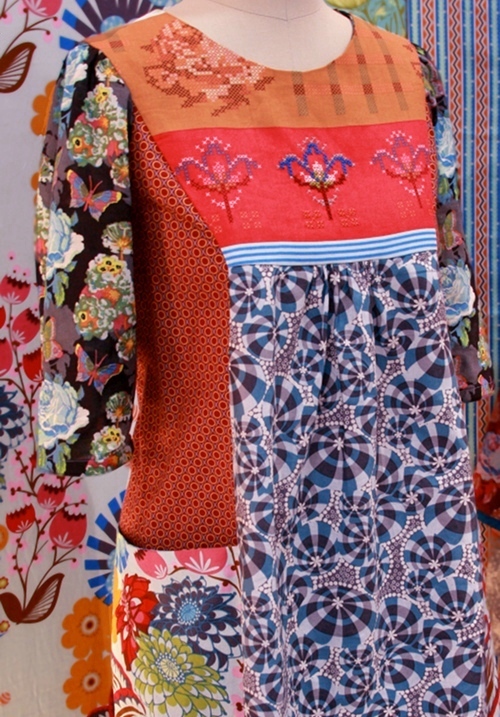 these lovely cutton threads and perfect embroideris catch all my attention! they looks so attractive! i can not help holding them!i must to say i fall in love with them! wo! these are real artwork and wonderful workmanship,and i want to learn it! I love all of this. I'm always dying to see what you designers bring to quilt market. Thank you so much for the free flower patterns. I've been eyeing your header for the last month wondering if I could try to copy that beautiful flower. Now I can. THANK YOU!! You really do beautiful work! You do such nice work. I'm always inspired when I visit your blog. You are so inspiring! Seems you out do yourself with every new adventure! Just when I think one line of fabric is my favorite...you come up with a new favorite. The first pillow is super cute! I've been spending a little too much on fabric lately so I probably won't buy it for a while, but I was thinking just a tiny square of lace in the middle of a yoke or a wide band collar would be very pretty. I love that you have this line! you have inspired me to stitch and i am so excited to get those Pearle cottons in my hands! Beautiful work, it is so beautiful all the things you do. Curcumin's anti-inflammatory properties have been known in Chinese and Ayurvedic Medicines for thousands of years. It is the active ingredient of turmeric, which is a component of the curry preparations used daily in pakistan and other South Asian cuisines. Cool, Which seems to be very important and it made good time pass for me. I will always give a nice thrust look in to you from my bookmark feed. I am happy when viewing your blog with updated information! thanks a lot and hope that you will post more site that are related to this site. The ideas you provided here i will discuss extremely precious. It proved a really pleasurable surprise to acquire that anticipating me after i awoke today. They’re constantly to the stage and easy to be aware of. Thanks plenty to the valuable ideas you’ve got shared below. Your work is so beautiful. You should try selling these, as well. It is very lovely work for all person who want to send gift in Pakistan , so visit www.giftguru.com.pk , I have send many gift with the help of all person. found your article bookmarked by a friend of mine. I was very pleased to find this site.I wanted to thank you for this great read.I definitely enjoyed every little bit. Evim Sensin and It was great really ! And especially film izle was good! I like this post, as well as this whole site. updatefilm.net 2012 yılında kurulan ve internetten film izleme deneyimini üst seviyeye çıkartmayı hedefleyen bir film sitesidir.Zamane şartlarına uyum göstererek 720p film, 1080p film ,HD Film,Tek Parça,2013 Filmleri dallarında da faaliyet gösteren yeni nesil film sitelerinin arasına girmeyi hedeflemektedir.Kullanıcını deneyimini geliştirmek ve filmlerin kusursuza yakın bir hızda izlenmesini sağlamak için var gücüyle çalışmaktadır. my name is khan 720p izle filmin 2010 yılının en harkia filmlerinden biridir.